The Organic Surge Super Intensive Daily Moisturiser is very rich and thick in consistency. It feels almost balm like, very luxurious and moisturising, but melts into the skin easily without leaving a greasy feeling. The saying a little goes a long way really does run true with this cream. Only a tiny amount is sufficient for the whole of your face which means it last a long time. The addition of the Rose Gernium Essential Oil gives the cream a light and fresh fragrance without being overpowering. As it is rather rich, I find it to heavy to use during the daytime for my normalish type skin, I prefer to use at night-time. I think it could work brilliantly for dry skin however for those of you with oily skin you may find this cream too heavy. I tend to find that natural/organic products tend to be priced on the more expensive side. However the organic surge cream, at £8.99 a tub is affordable and great value for money. I would highly recommend waiting for a promotion as I managed to pick it up for £2.25 during a sale, and there seems to be promotions running every so often on the website. 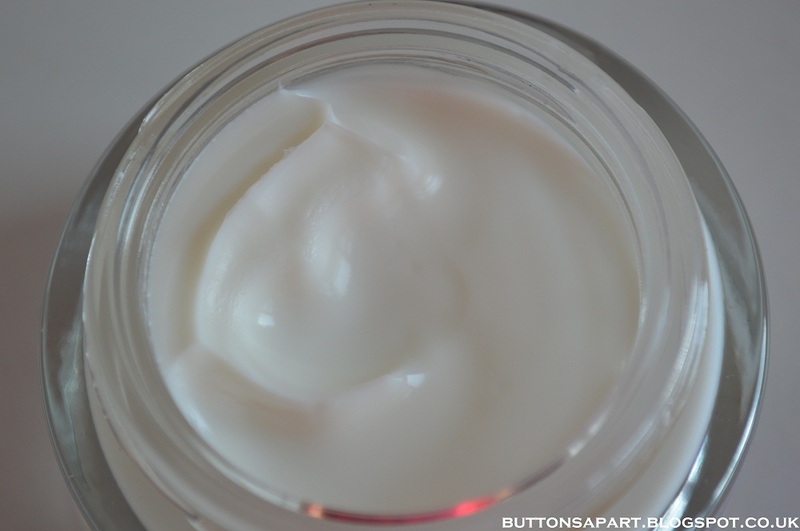 This face cream is certified organic by Ecocert and is suitable for vegetarians and vegans. For those of you interested I did run the product ingredients on the EWG skin deep website and the score was 3. Overall I think this face cream works well and is a great option if your looking for something containing more natural and organic ingredients, without wanting to break the bank. Aqua (Water), Aloe Barbadensis Leaf Juice*, Glyceryl Stearate SE, Glycerin**, Theobroma Cacao (Cocoa) Seed Butter*, Butyrospermum Parkii (Shea) Butter*, Stearic Acid, Simmondsia Chinensis (Jojoba) Seed Oil, Cetearyl Alcohol, Isopropyl Myristate, Vitis Vinifera (Grape) Seed Oil, Benzyl Alcohol, Zea Mays (Corn) Starch, Tocopherol, Pelargonium Graveolens Oil, Dehydroacetic Acid, Pelargonium Graveolens Flower Oil, Citronellol, Geraniol, Camellia Sinensis Leaf Extract, Chamomilla Recutita (Matricaria) Flower Extract, Linalool, Citral, Potassium Sorbate, Sodium Benzoate. *naturally-derived ingredient. **made using organic ingredients. 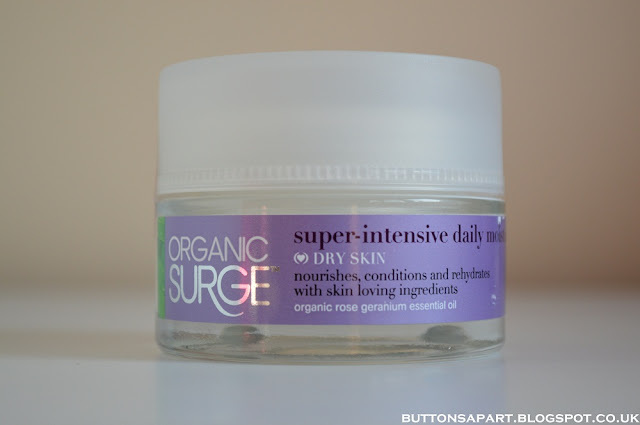 The super-intensive daily moisturiser comes packaged in a glass tub, making it easy for you to get the amount of product you require. 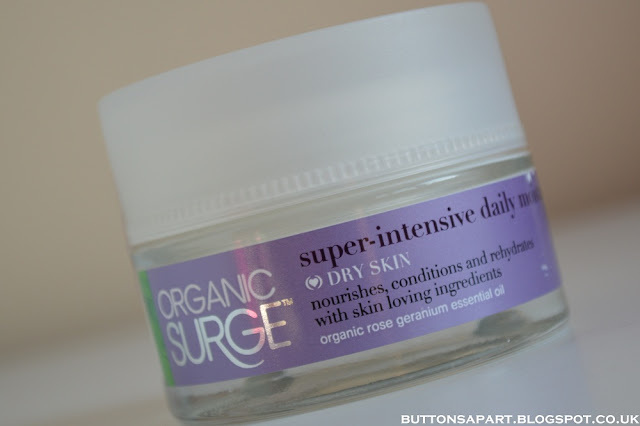 Have you tried the Organic Surge super-intensive daily moisturiser? What were your thoughts? Just a quick and very easy last minute Halloween outfit idea for you...if you haven't yet got your outfit planned! This pirate look was very simple to do. I paired a striped long sleeved t-shirt with some red trousers. I added some black boots and multiple long necklaces. I wore a scarf around my head and completed the look by making my own pirates eye patch. I did this by cutting out an eye patch shape from a piece of black card, I then poked holes either end threaded through a piece of string and tied it around my head. Following my empties post I had a few products that I needed to replace or in the case of the deodorant will soon need to replace so I picked up a few items from feel unique. 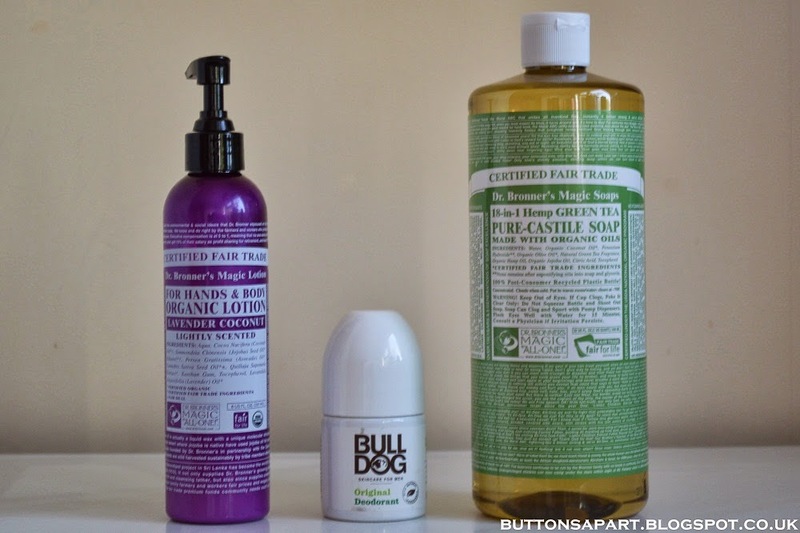 I was in need of a new body lotion and I liked that Dr Bronner's is certified fair trade and USDA organic, the products aren't tested on animals and that the ingredient list was chemical free. I went with the lavender coconut scent as I love coconut scents and as I tend to moisturise at night just before bed the lavender would help me fall a sleep. Bull Dog is actually a Men's natural skincare company, they're products are free from parabens, sodium laurath sulphate, artificial colours and synthetic fragrances, they do not test on animals and have the BUAV leaping bunny logo. The products are suitable for vegetarians and vegans. I know they are a men's skincare company and I'm not a man but at the end of the day it's deodorant, it doesn't bother me whether it's being marketed towards men or women. Another Dr Bronner's product, I was intrigued by the 18 different uses, my original intention was to use this as a shampoo as I had finished the last of my shampoos as shown in my last empties post. However after using the product twice as a shampoo I think I may need to re-evaluate that plan. However there are still 17 other uses I need to test out! I hope you enjoyed this little haul post. What items have you bought recently? Any product recommendations? In today's post I have some empties to share with you, these are the products I've used up during the end of September and Beginning of October. I did like this body lotion, the cream absorbs into the skin well, leaving is moisturised without feeling greasy, you only need to use a small amount as a little goes a long way, the only thing I wasn't too keen on was the scent of this body lotion however they have few other body lotions so I will give them a try. If you would like to read my full review you can click here. This conditioner is rather old so I'm not sure body shop even sell it any more. I did like it, my hair felt soft after use and less tangled, but I didn't love it, I prefer the rainforest forest hair butter from The Body Shop compared to this conditioner. I'm so glad to have this shampoo finished and gones, I don't think there was anything I liked about it. This dry shampoo works well, however I am moving towards more chemical free products so I won't repurchase. This little gift set came with a shampoo, conditioner, shower gel and handcream, The handcream I had at work and forgot to bring it's hence not in the picture and currently in the bin. All the products in this set came beautifully packaged, and smelt absolutely gorgeous and fresh. However the products themselves were only okayish. I love this skin cleanser, I have been using it everyday for the past 10 months, it works very well for me, and I do have another one the same size to get through, however after that I won't be repurchasing because it does contain parabens and cetaphil is not a cruelty-free company. I took these products with me when I went away but I took a picture a picture of them before throwing them away, they are in handy size to take away, they are mediocre products that do the job, but nothing I would run out to purchase. I also gave away my Bobbi Brown Mauve Face Palette, which I had never used, I didn't have a chance to take a picture of it but it's in my makeup sort out post. I hope you enjoyed this post. 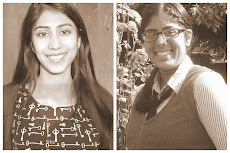 What products have used up this month? Let me know in the comments below. 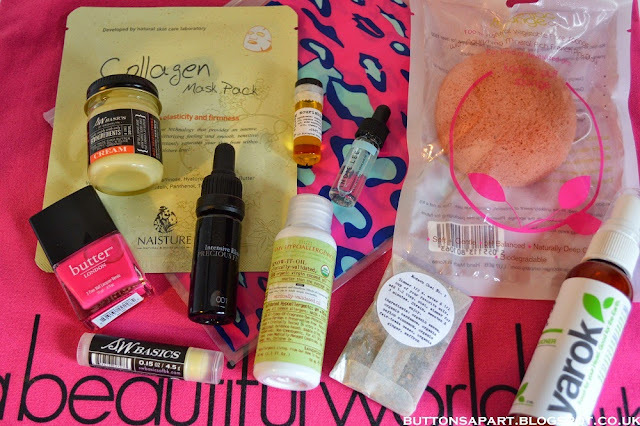 I received my A Beautiful World's Autumn/Winter Beauty Box and I wanted to share with you my initial impressions. 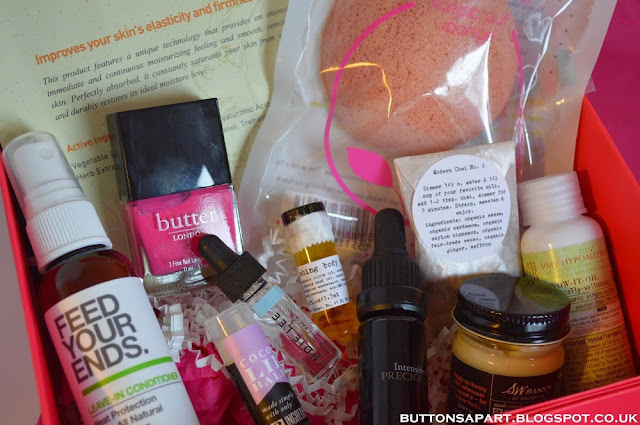 After spotting posts on various blogs on the spring/summer sampler box and the gorgeous goodie's inside I knew I had to get my name on the waiting list for the autumn/winter box. 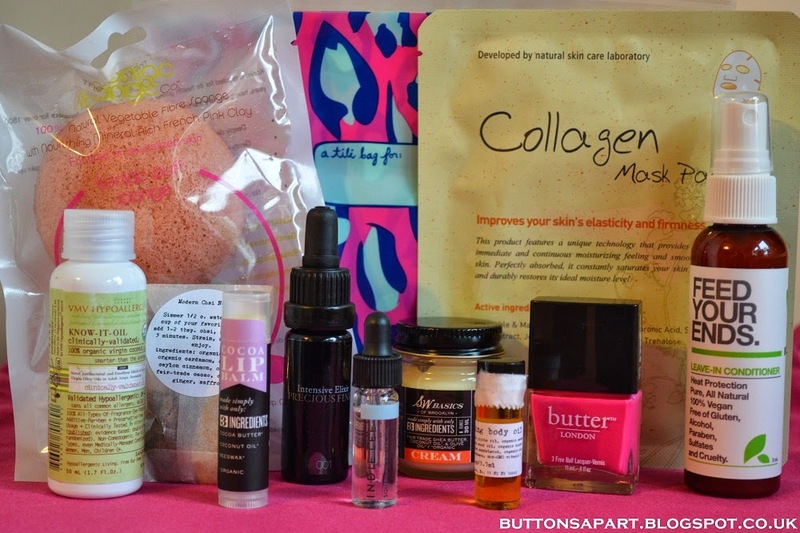 And let me tell you I am not disappointed that I did, because this box is jam packed full of full size and sample products that I am eager to try out. I've actually never tried products from any of these companies which is great because this will be a great opportunity to discover new brands. I have to mention I was rather impressed with the service, I ordered the box on Wednesday morning and the same evening I received a text informing me that the box would be in my hand son Thursday morning. This is a 100% natural vegetable fibre sponge with nourishing rich french pink clay. Thi sproducts sounds interesting,you can use the sponge to cleanse and exfoliate the skin as well as to remove makeup. I've had my eye on this product for a while so it was definitely the product I'm most excited about! I've never tried a paper face mask so this will definitely be one of the first products to be tried. The mask contains vegetable collagen from carrots to help strengthen the skin as well getting to the skin to look more radiant. With the colder whether my skin has started to look a but dull so hopefully this mask will it give it a much needed boost! I love that this company makes products that are 100% vegan, free of gluten, alcohol, parabens and sulphates, as well as cruelty-free. My heat protection spray is towards it's last legs so this will make the perfect replacement. I love to use coconut oil as a deep conditioning treatment for my hair. Coconut oil has mainly uses and is a great little multi-tasker to have handy. This cream is made of only 3 ingredients fairtrade shea butter, organic coconut oil and organic olive oil. 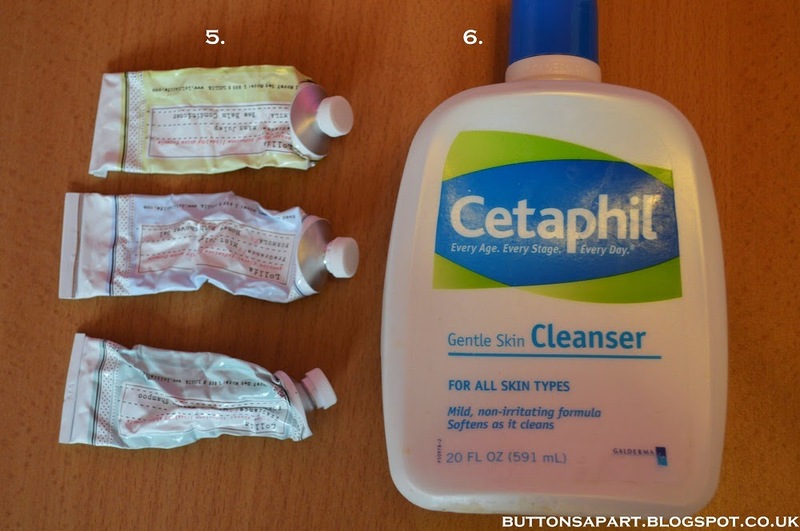 I'm thinking that this will be a great little skin rescuer during the winter. As with the Shea butter cream the lip balm is also only made with 3 ingredients, I love that this company makes products with minimal ingredients and are chemical free. I was excited to see a full sized nail varnish within the products. The shade is similar to something I already have and more summer than autumn-winter so I would have preferred another colour. However I have never tried Butter London products before and I love that their polish's are free from formaldehyde, DBP and toluene. I have to admit squalene oil is not something I have heard of but I'm definitely intrigued. Believe it or not my night cream is nearly finished, I feel like this box somehow knew just exactly what I was in need off. This nourishing body oil is a blend of rose, cardomom and sandalwood oils, it smells absolutely heavenly. And I know it's going to make a great treat for my skin. I have to admit I'm not a tea drinker so this product will be passed on. 001 is niche botanical skincare brand which new to a beautiful world and due to go on sale soon. This is a facial oil which smells absolutely gorgeous and with its blend of sandalwood, patchouli, rose, frankinscense and vitamin E sounds absolutely luxurious. To be honest this is just a glammed up version of plain zip lock freezer bag. I wouldn't buy it but seeing as it's come in the box I guess it adds a extra bit of cuteness rather than using a plain bag for your liquid items whilst travelling. Last but not least there's a handy A Beautiful World Pink Tote bag! I have to say overall this is an amazing box, well worth the 20 quid I spent on it! I can't wait to have a play with the products and I'll definitely be following up with some reviews. The box sure was super popular as it is already out of stock, however you can sign up to get on the waiting list to be emailed when the Spring/Summer box is released by clicking here. Did you manage to get your hands on a box? What were your thoughts? P.S I am still on my buy nothing new for a year challenge however if you read my original post personal hygiene items are excluded. buy nothing new for a year challenge: 50 days in. I'm excited to share with that it has been fifty, yes fifty whole days since I started my buy nothing new for a year challenge! Rather than go shopping with friends I have been going out to eat for lunch or dinner, or going for a coffee and having a catch up. More recently I did spend a day shopping with my friend, she was shopping for her wedding and it was nice helping her out without feeling like I had to buy something myself. I've decided to start making a wish list of items I have wanted to buy and at the end of the year challenge if I feel I still need them I can then go and purchase them, but for now I still staying strong. 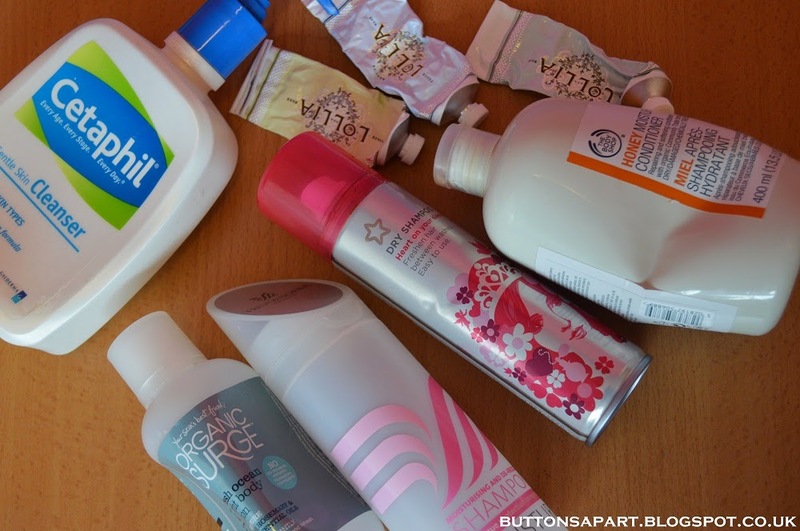 This is my September empties video. 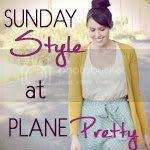 If you prefer reading to watching a video then you can find my blog post here. These are the products I've used up during the beginning of September and what I thought of them. I have somewhat of a love hate relationship with this shower gel. I initially loved it but then the tub was so big I got sick of the scent and using the same shower gel everyday so I had to switch it up, after a while I Came back to it and really liked it again but then once again I started getting sick of it! I have a full review on this product which you can find here. 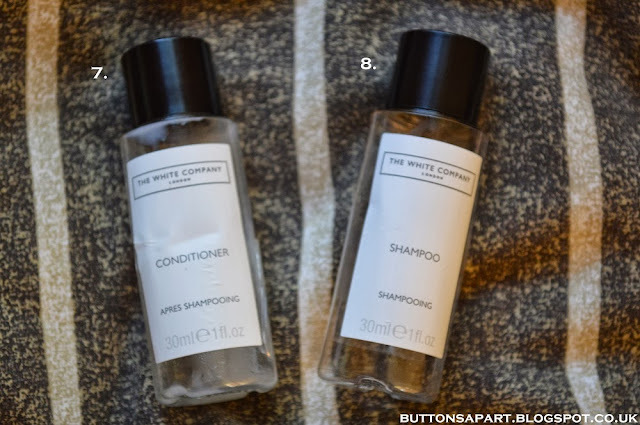 I wasn't a fan of this Shampoo and Conditioner set. They did the job but they didn't work brilliantly for me. I didn't like the scent either. I found this face cleanser to be a bit drying for my skin type, so instead of using it every day I used it once a week. 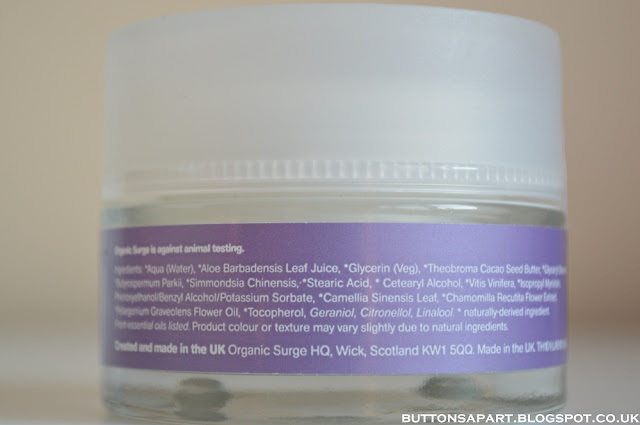 The cleanser contained pink beads and as a result it worked quite well as an exfoliator for me. I think this product would suit more of an oily skin tone. This is classic scent and one which I love. There's not really anything more I can say about it. I'm glad to be getting through a lot of these little perfume samples. I did not like this conditioner at all. I prefer rich moisturising conditioners. This was rather thin and runny in consistency and didn't do anything for my hair. Although there's no change in the makeup products this month, its good its good to have dropped down below one hundred on the skincare count! 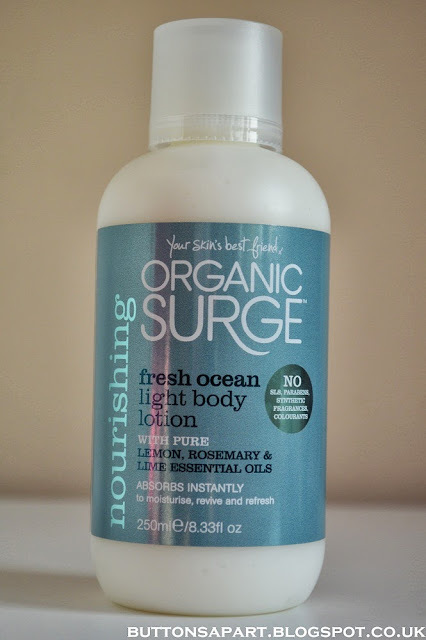 I am back with a review post of the Organic Surge Fresh Ocean Light Body Lotion. 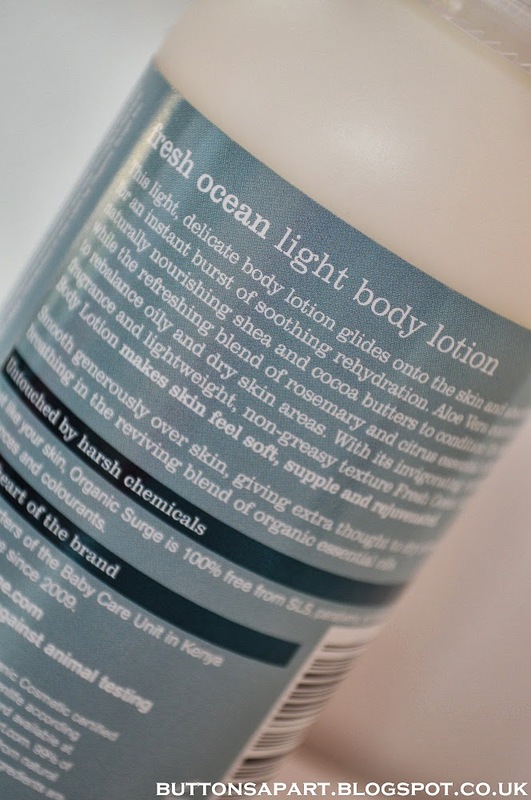 Fresh Ocean Light Body Lotion glides onto the skin and absorbs quickly for an instant burst of soothing rehydration. Aloe Vera combines with naturally nourishing shea and cocoa butters to condition the skin, while the refreshing blend of rosemary and citrus essential oils work to rebalance oils and dry skin areas. With its invigorating, natural fragrance and lightweight, non-greasy texture it makes skin feel soft, supple and rejuvenated. The Organic Surge Fresh Ocean Light Body Lotion absorbs into the skin well. It is light to medium in consistency but don't let that fool you because it leaves the skin feeling hydrated and moisturised. A little goes a long way and it leaves no greasiness. 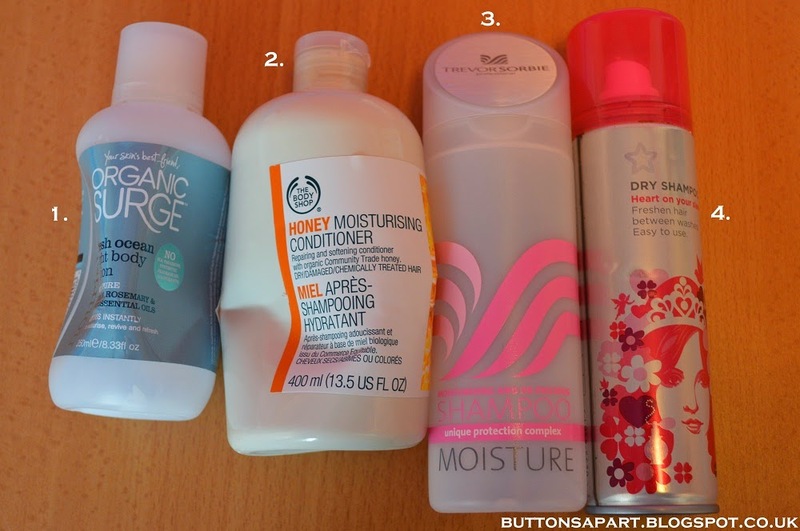 I like that the lotion is free from SLS, parabens, synthetic fragrances and colourants. It is certified organic by ECOCERT, The product is also suitable for vegetarians and vegans. The main thing I don't like about this body is lotion is that scent. 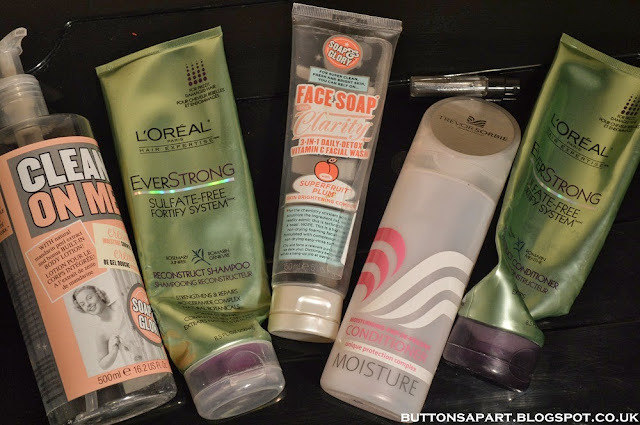 When it comes to a body lotion I do prefer to use something that I love the scent off because its something I'm using all all over and the scent tends to linger. Although this particular scent isn't too my taste there are a few other body lotion options that I would like to try out. Aqua/Water, Aloe Barbadensis Extract*, Caprylic/Capric Triglyceride, Glycerin, Isopropyl Myristate, Polyglyceryl-Dicitrate/Stearate, Cetearyl Alcohol, Glyceryl Stearate, Theobroma Cacao (Cocoa) Butter*, Butyrospermum Parkii (Shea) Butter*, Helianthus Annuus (Sunflower) Seed Oil*, Citrus Limon (Lemon) Peel Oil*, Citrus Aurantium Dulcis (Orange) Peel Oil*, Citrus Aurantium Bergamia (Bergamot) Fruit Oil*, Cymbopogon Martinii (Palmarosa) Oil*, Rosmarinus Officinalis (Rosemary) Leaf Oil*, Citrus Aurantifolia (Lime) Peel Oil*, Mentha Piperita (Peppermint) Oil*, Benzyl Alcohol, Dehydroacetic Acid, Sodium Phytate, Sodium Stearoyl Glutamate, Xanthan Gum, Citric Acid, Limonene, Geraniol, Linalool. *ingredient from organic farming. Naturally occurring within essential oils. I always prefer packaging that you don't have to dip your fingers into as I think it is more hygienic. However the bottle packaging isn't ideal as you can't get all the product out, I think a squeezy tube would have been a better option. 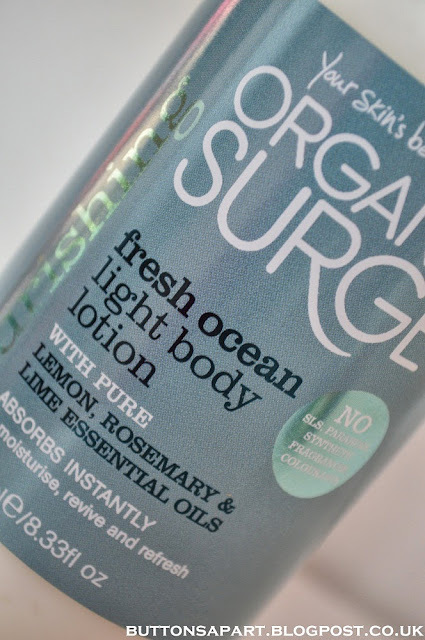 Have you tried any of the Organic Surge Fresh Ocean Light Body Lotion? What are your thoughts?